How do things seem to be running now? Everything seems to be working fine. No more Avast warnings and mbam scan was clean. One odd thing though, every time I open Firefox it opens a "welcome to firefox" tab and a tab for every addon I have installed as if I just installed it. Like the profile isn't beijing saved. Interesting. I'm not seeing anything in your logs that I can for sure would account for that. The infection we removed did try to "hook" Internet explorer and perhaps it effected Firefox also. Your firefox profile wasn't removed. I run a no script add on for firefox that opens a tab every time I start firefox. I have always assumed there is some setting I need to "adjust" to make it stop but I'm to lazy to check it out. I do most of my "work" here from home on my laptop and seldom ever shut firefox off. Other than that, the only time I can think of that I get the Welcome to firefox message is firefox is updated. How about you run me a set of DDS logs for me to give a last look over. C: is FIXED (NTFS) - 450 GiB total, 390.944 GiB free. 2/1/2014 12:46:05 PM, Error: Service Control Manager  - The Client Virtualization Handler service hung on starting. That is looking pretty good, but let's see if we can clean up some orphans. Please run combofix again like you did before. Great. That swept out the orphans. Is Firefox still acting "weird"? I completely uninstalled it and so far it seems to be back to normal. And then you reinstalled and gave it a test drive? Yes, I no longer have "welcome to firefox' tab popping up nor tabs for all my adons every time I open firefox. I used Revo uninstaller. It runs the firefox uninstaller and then searches for remnants. 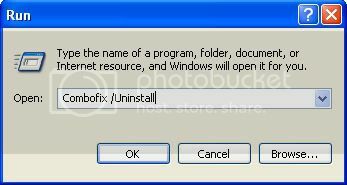 Make sure during the firefox uninstall that you check the box to uninstall all your settings. I believe we can clean up and let you get back to your regularly scheduled life. i did all of the above without any problems. Thanks for all your help. I will definitely read everything you suggested and make sure my wife does too. Thanks again!